The cover on the right says things, too. Here, South African Paralympic star Oscar Pistorius is featured on this week’s cover of Time magazine. Pistorius has been charged with murdering his girlfriend and he is under trial in South Africa. 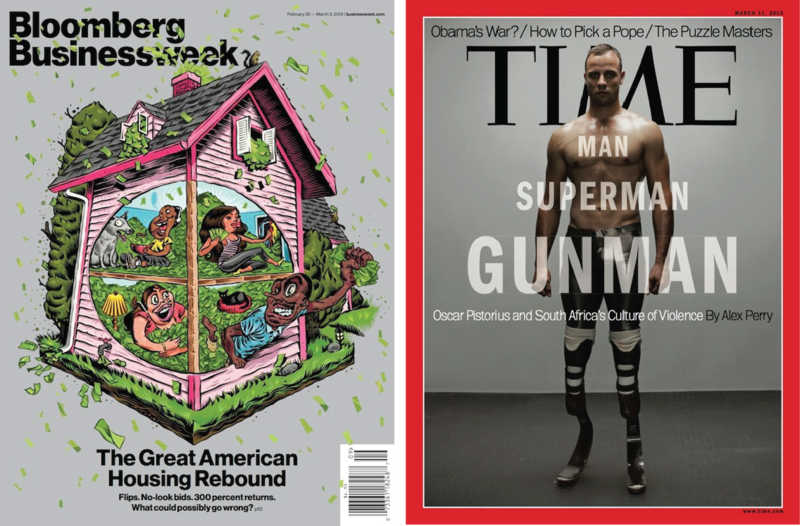 In my mind, his purported “icy glare” with the word “Gunman” seems to indict him as being guilty; the photograph itself––although very well executed––seems to go further by depicting Pistorius as some kind of cyborg-like monster. This isn’t the first instance in which Time has dabbled with controversial covers. Take a look at the examples below. The cover on the far left is perhaps the magazine’s most notable cover. Former NFL running back and alleged murderer O.J. Simpson was featured on a cover in 1994 sporting a rough-faced “five o’clock shadow” that the magazine later admitted to enhancing. The other covers, the mom nursing the older boy (published in 2012) and the disfigured Afghan girl (that appeared in 2010), might be criticized for being too shocking. Here’s the question: Even in this Web-dominant world, magazines must sell on newsstands to generate revenue. Having worked for a publisher, I can tell you that magazine covers are specifically chosen for their abilities to sell. In fact, they’re designed to sell. So is it morally right that magazines shock and perhaps even editorialize just to sell more copies? What can we say about the choices that were made in these cases?